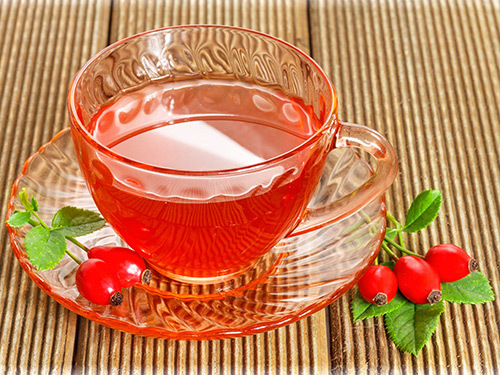 I write this article on herbal tea recipes with a cup of steaming hot wild rosehip tea before me. The bright red orbs swirl in my glass. Several weeks ago I was out gathering the last of these rosy jewels right from the bush. After giving thanks for this wild treasure, I carefully dried a jar of them for this moment. This is one of my favorite herbal tea recipes and it's so simple to make. All that is needed is a pot, rose hips, and some water. Like so many other areas of life, when it comes to making your own herbal teas, less is more. This is the art of tea. For cultures all over the world have been brewing and serving tea for thousands of years. And in its simplicity, it's really nothing more than brewing together a few delicious plants for the tasting. Tea is one of the most extensively consumed drink in the world, next to water. And there's good reason for that. There are herbal tea recipes that reduce risk of heart disease, lower cholesterol and reduce the risk of heart attack and cancer. There are herbal teas that are chock full of anti oxidants, vitamins and minerals. Drinking herbal teas has tremendous health benefits like boosting your immune system, jump starting your metabolism, offering a pick me up, soothing your nerves or troubled mind, easing insomnia, and helping with a sore throat or common cold. Buying a cup of tea in a café or coffee shop can be pricey nowadays. When I buy a cup of tea I'm paying for the service, the cup, and the hot water, in addition to the few herbs. Making your own with herbal teas cost just pennies, if that. So the benefit of herbal tea recipes is threefold. You save money and you customize your cup of tea by hand blending a variety of herbal teas together and you steep in a deep nature connection. Fusion is the word that comes to mind for you are evenly blending multiple tastes together into every cup of tea you drink. Making tea from herbal tea recipes is not only medicinal, pleasurable and refreshing to the spirit but an invitation to all your senses to step into the present. The textures, colors and scents of all the different herbs beckons us into mindfulness. Herbal teas make great gifts, are great for baths, and can turn into a beautiful everyday ritual. 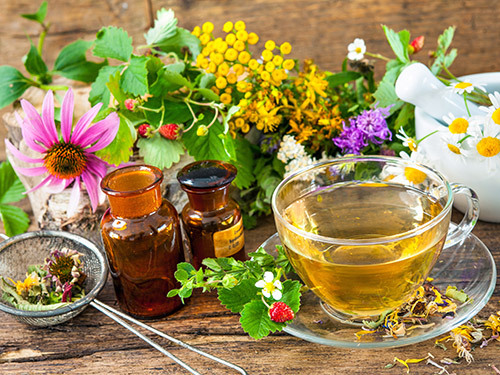 Lastly, drinking tea from herbal tea recipes you make yourself brings you the knowledge and assurance that you're creating a drink that is filled with powerfully infused nourishment and medicine, thus bringing yourself health and vitality. You did it yourself and you just can't put a price on that. Here are some herbal tea recipes that are for every day, weekly or monthly use. Many of these herbs or some variety of their species are common and found throughout North America if not throughout the world. I've chosen every day recipes so you can know just how simple it is to brew up a cup that could be drank more than once, once you make a batch and store in a glass, air tight container for future preparations. Enjoy! I already told you how I love rose hips. Rose hips have a lot of vitamin A which is great for your skin as vitamin A is considered to be the skin vitamin. Also high in vitamin C, rose hips are one of the best sources for getting this vitamin in your diet. Bring water to a boil. Add rose hips and steep 15 - 20 minutes. Reheat and add honey if desired. Sip and enjoy the citrusy flavor all the while knowing this drink is helping to regenerate your skin and supporting your immune system! If you've got a pounding headache that just won't go away no matter what you do, try this soothing brew the next time a headache comes on. Blend all herbs together and steep 2 tsp. of this blend in 1 ½ cups boiled water. Steep for a minimum of 20 minutes or longer. Strain and reheat if it has gone cold to ensure you drink it while it's warm. Store the remainder of your blend in an air tight glass container. Ever found yourself eating a meal and feeling full to the point of being bloated? This is one of the most common kinds of herbal tea recipes that can be added to or slightly changed if needed. For example, you could take out an herb, add an herb, use a little more or less of an herb depending on how you want your tea to taste. You can use fresh or dried herbs but I always prefer fresh for this recipe. Add herbs to a pot. Add 4 cups of boiling water and steep for 10 - 20 minutes depending on how strong you want your tea to taste. Strain, pour, add honey if desired and enjoy as your digestive troubles are put to ease. This is one of my favorite herbal tea recipes. The taste of earth comes out quite strongly and I can taste the detox in the taste itself. Dandelion is an incredible detoxifying herb rich in many vitamins and minerals. Place the dandelion roots and water in a pot and bring to a boil. Simmer for 15 - 20 minutes. Strain and add maple syrup if you desire to sweeten it. Make sure to take in the aroma while you drink. This tea is great for relieving abdominal cramps and stomach pains. Place 6 tsp. mixed herbs in a pot with water. Simmer 10 - 15 minutes. Strain. Enjoy with honey if desired. Try drinking several cups a day if needed. Store the remainder of your blend in a glass, air-tight jar. Of all the herbal tea recipes here, this one offers you the opportunity to purify your blood, detox your body, boost your immune system, help clear your skin and bring you more radiance all in one cup. I love to drink various forms of this tea in the springtime when the plants can be freshly gathered. Combine all herbs together and store in a clean, air-tight glass jar. For brewing, add 2 tsp. of your mixture to 1 ½ cups of boiling water and steep for 10 minutes or more. Strain and add honey to taste if desired. I remember over a dozen years ago spending a special mentoring moment with an elder of mine who has now passed on, Gilbert Walking Bull. Gilbert was a traditional holy man of the Oglala Lakota, and a personal mentor and elder who impacted me deeply. He brought us out into the pine forests near his home in the Black Hills of South Dakota, and we spent some time together learning about a certain variety of Echinacea that was native to his home there. He spoke of both the physical and spiritual qualities of the plant, and how harvesting the plant yourself, with authentic gratitude in one's heart, actually impacts the quality and quantity of medicine and nourishment in the plant. I felt both in awe of this idea, and yet not surprised all at the same time. After all, why wouldn't my heart's thankfulness impact the plant whose life I was taking? I've since integrated that teaching into my practices, into my life. Concocting my own herbal tea recipes from scratch has been so deeply satisfying over the years. The experience of going out and gathering plants from the wild or even from my own backyard has been an empowering act, and always deepened my sense of gratitude. The freshness, potency, nutritional, and medicinal value is much stronger for herbs I have foraged and gathered myself. They also grow locally so there's something to be said for having a connection with one's herbal tea recipes not only because you put it together but also because you went out and gathered the plants yourself. The first summer I gathered enough herbs for a full year's worth of tea, I didn't buy a single box of tea over those next twelve months. It was powerfully freeing to build this kind of relationship with the Earth, and gave me a great opportunity to learn how to make my own herbal tea recipes from scratch. I haven't turned back since. I now gather all sorts of diverse herbs for making herbal tea recipes throughout the seasons of the year. I offer that to you as a nudging invitation to go out and try it sometime. Wander into the woods or your backyard and gather some herbs for your own herbal tea recipes. Feel the connection with the bodies of the plants and the body of the Earth alive in your body. Share these with friends and family through the seasons. Don't be surprised when a new level of gratitude rises from your heart and your connection with nature that's reflected in your cup and the nourishing, healing effect it has on you and your people. Interested in being personally mentored in Edible Wild and Medicinal Plants, on a transformational journey of connection to nature, community, and self?